데이터는 다른 사용자와 공유할 때 가장 강력합니다. 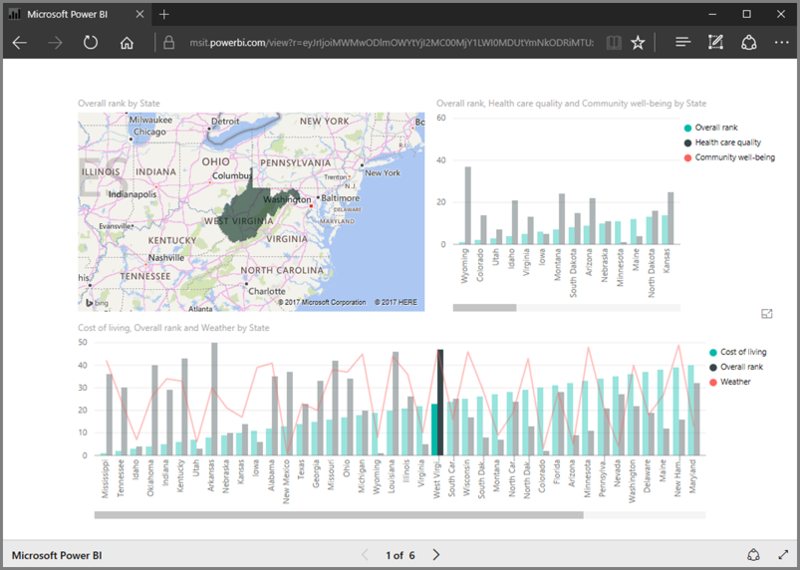 Power BI 데이터 통찰력을 게시, 내보내기, 공유 및 배포하는 방법을 살펴봅니다.Data is most powerful when shared with others - learn how to publish, export, share, and distribute your Power BI data insights. 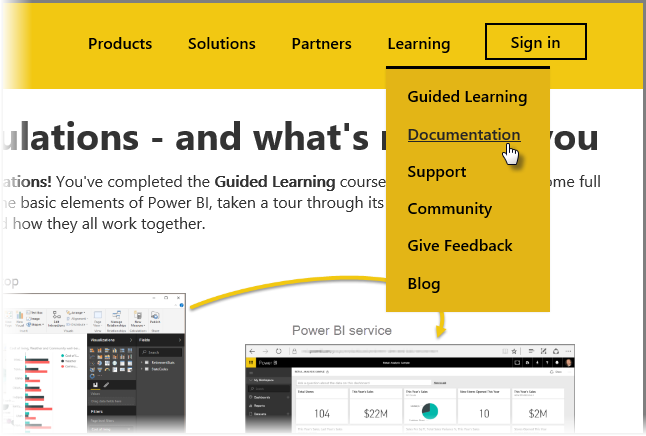 Power BI에 대한 단계별 학습 과정의 게시 및 공유 단원을 시작하겠습니다.Welcome to the Publishing and Sharing section of the Guided Learning course for Power BI. Excel과 Power BI가 원활하게 함께 작동하는 방식과 보고서 및 대시보드에서 만들 수 있는 시각적 개체에 대한 모든 내용을 배웠으므로 이를 동료 및 친구와 공유하고 싶을 것입니다.Now that you've learned how Excel and Power BI work seamlessly together, and you've learned all about the visuals you can create in reports and dashboards, you likely want to share them with your coworkers and friends. 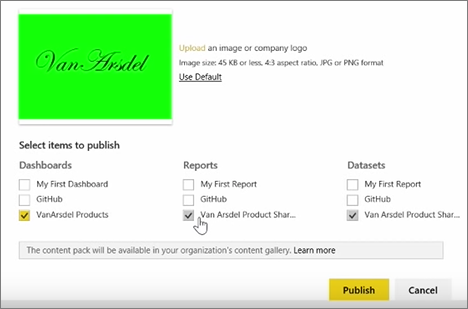 Power BI를 사용하면 게시 및 공유가 간편합니다.With Power BI, publishing and sharing are easy to accomplish. 동료에게 보낼 대시보드, 보고서 및 데이터 세트가 패키지된 콘텐츠 팩을 만듭니다.Create Content packs that package up a dashboard, report, and dataset to send to your colleagues. 동료는 이 콘텐츠 팩에서 시작하여 이를 개선할 수 있습니다.They can use it as a starting point and further enhance it. 대시보드, 보고서 및 데이터 세트에 대한 액세스 권한이 있는 사용자의 하위 세트를 식별하기 위해 보안 모델로 사용할 수 있는 그룹을 만듭니다.Create Groups, which you can use as a security model to identify a subset of users who have access to dashboards, reports, and datasets you create. 이 모듈에서는 대부분 새 재무 그룹을 설정하는 시나리오를 사용합니다.Throughout much of this module we use the scenario of setting up a new finance group. 그룹을 설정하고, 대시보드 보고서 및 데이터 세트를 그룹에 공유하고, 그룹에서 항목에 액세스할 수 있는 구성원을 추가하는 방법을 알아보겠습니다.We'll show how to set up the group, share dashboards, reports, and datasets into the group, and add members who'll have access to the items in the group. 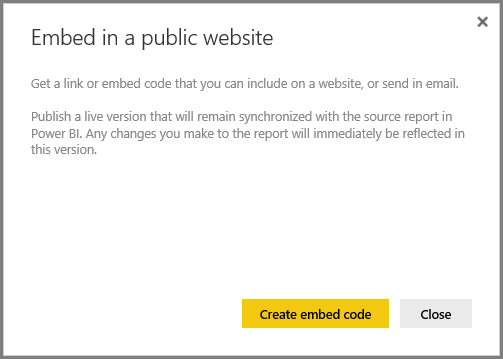 Power BI 서비스에 보고서를 빠르고 쉽게 게시할 수 있습니다.Publishing your reports to the Power BI service is fast and easy. 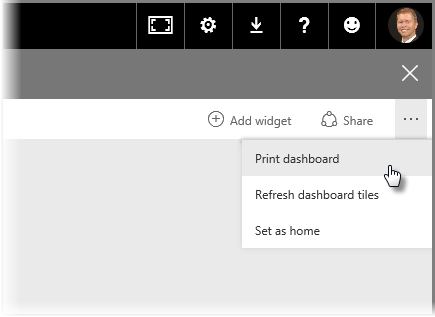 Power BI Desktop에서 보고서 작성을 완료한 후 Power BI Desktop의 홈 탭에서 게시 단추를 선택하기만 하면 프로세스가 시작됩니다.Once you've completed authoring your report in Power BI Desktop, just select the Publish button on the Home tab in Power BI Desktop, and the process begins. 시각화, 쿼리 및 사용자 지정 측정값을 포함하여 보고서 및 데이터가 함께 패키지되어 Power BI 서비스에 업로드됩니다.Your report and data, including visualizations, queries, and custom measures, are packaged together and uploaded to the Power BI service. 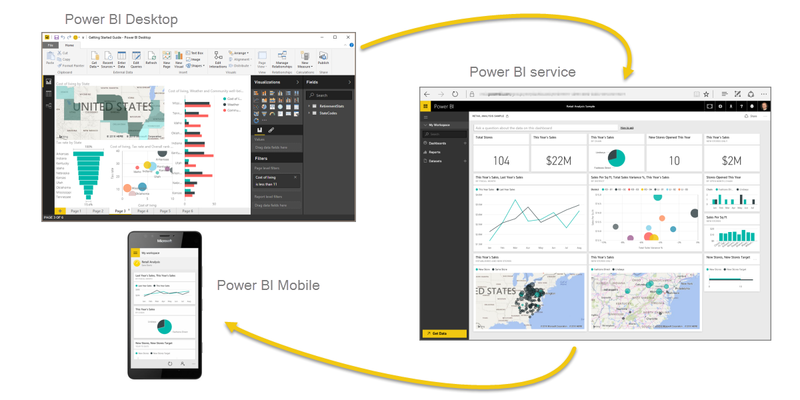 일반적으로 Power BI Desktop 보고서를 .pbix 파일이라고 하며 이는 Windows에서 지정된 확장명입니다.It's common to refer to Power BI Desktop reports as .pbix files, which is the extension they're given in Windows. 업로드가 완료되면 게시 프로세스가 성공적으로 완료되었음을 알리는 대화 상자가 나타나고 해당 대화 상자에 웹 브라우저에서 Power BI 서비스의 보고서로 직접 이동하는 링크가 제공됩니다.Once the upload is complete, a dialog box tells you the publishing process succeeded and a link is provided in that dialog to take you directly to your report in the Power BI service, in a web browser. 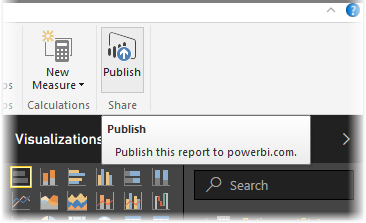 이와 같이 Power BI Desktop에서 Power BI 서비스에 보고서를 게시하는 작업은 간단합니다.And that's it - it's easy to publish reports from Power BI Desktop to the Power BI service. 다른 사람과 공유할 수 있도록 인쇄된 보고서 또는 대시보드를 가지고 회의에 참석해야 할 경우가 있습니다.Sometimes you may want to bring a printed report or dashboard to a meeting, or so you can share it with others. Power BI를 사용하면 시각적 개체 인쇄물을 만들 수 있는 몇 가지 방법이 있습니다.With Power BI, there are a few ways you can make printouts of your visuals. Power BI 서비스에서 오른쪽 위에 있는 줄임표(...)를 선택한 다음 대시보드 인쇄를 선택합니다.In the Power BI service, select the ellipses (three dots) in the top-right side of the service, and select Print dashboard. 대시보드를 보낼 수 있는 프린터 및 세로 또는 가로 방향과 같은 표준 인쇄 옵션을 선택할 수 있는 인쇄 대화 상자가 나타납니다.A Print dialog appears, where you can select the printer to which you want to send the dashboard, as well as standard print options such as portrait or landscape orientation. 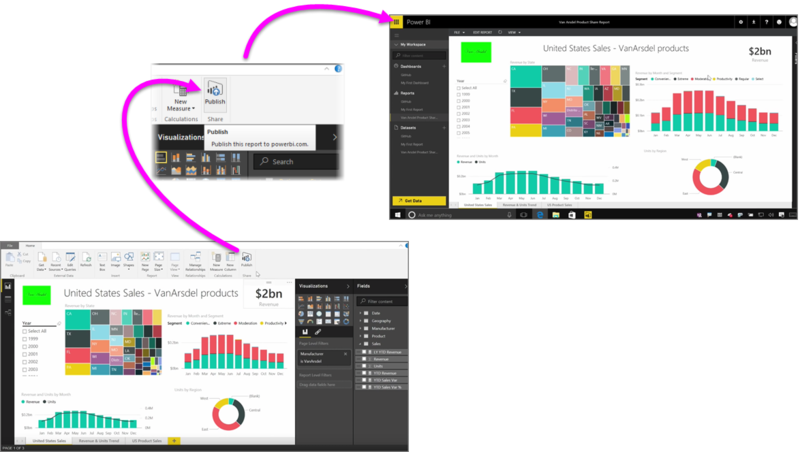 Power BI 서비스에서 모든 시각적 개체의 데이터를 내보낼 수도 있습니다.You can also export the data from any visual in the Power BI service. 시각적 개체에서 줄임표를 선택한 다음 데이터 내보내기 단추(가운데 단추)를 선택하기만 하면 됩니다.Just select the ellipses on any visual, and then select the Export data button (the middle button). 이렇게 하면 .CSV 파일이 생성되고 로컬 컴퓨터에 다운로드되며, 브라우저에서 시작된 다른 모든 다운로드와 마찬가지로 다운로드가 완료되었음을 알리는 메시지가 브라우저에 표시됩니다.When you do so, a .CSV file is created and downloaded to your local computer, and a message appears on your browser (just like any other browser-initiated download) letting you know the download is complete. 또한 보고서에서 직접 인쇄하거나 내보낼 수 있습니다.You can also print or export directly from a report. 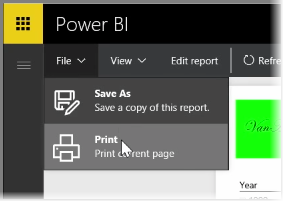 Power BI 서비스에서 보고서를 볼 때 파일 > 인쇄를 선택하여 인쇄 대화 상자를 엽니다.When viewing a report in the Power BI service, select File > Print to open the print dialog. 대시보드와 마찬가지로 시각적 개체에 대한 내보내기 단추를 선택하여 보고서 내의 시각적 개체에서 데이터를 내보낼 수 있습니다.And just like with a dashboard, you can export data from a visual within a report, too, by selecting the export button on a visual. 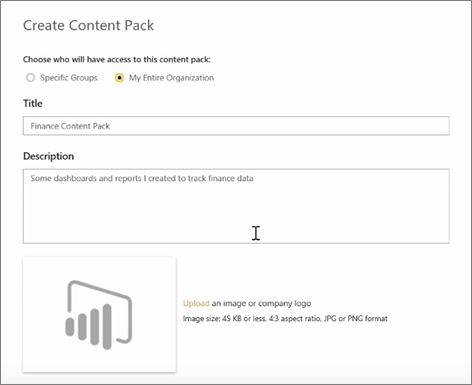 Power BI Desktop에서 Power BI 서비스에 이미 게시한 보고서 및 데이터 세트를 업데이트할 수 있습니다.You can update reports and datasets that you've already published from Power BI Desktop to the Power BI service. 이렇게 하려면 리본의 홈 탭에서 게시를 선택합니다.To do so, select Publish from the Home tab in the ribbon. 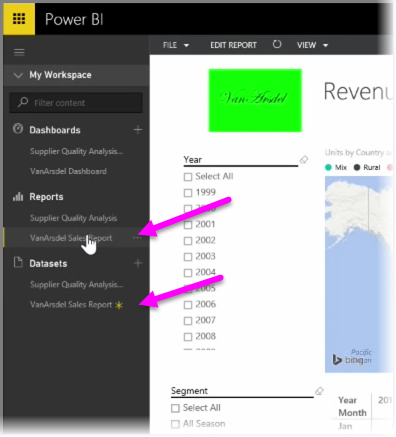 Power BI 서비스에 이미 있는 보고서를 게시하려고 하면 이전 데이터 세트 및 보고서를 방금 업데이트하도록 선택한 편집된 버전으로 바꿀지 확인하라는 메시지가 나타납니다.When you publish a report that already exists in the Power BI service, you're prompted to confirm that you want to replace the previous dataset and reports with the edited version you just chose to update. 바꾸기를 선택하면 Power BI 서비스의 데이터 집합 및 보고서가 가장 최근 Power BI Desktop 버전의 파일 내 데이터 집합 및 보고서로 덮어쓰기됩니다.When you select Replace, the datasets and reports in the Power BI service are overwritten with the datasets and reports in the most recent Power BI Desktop version of the file. 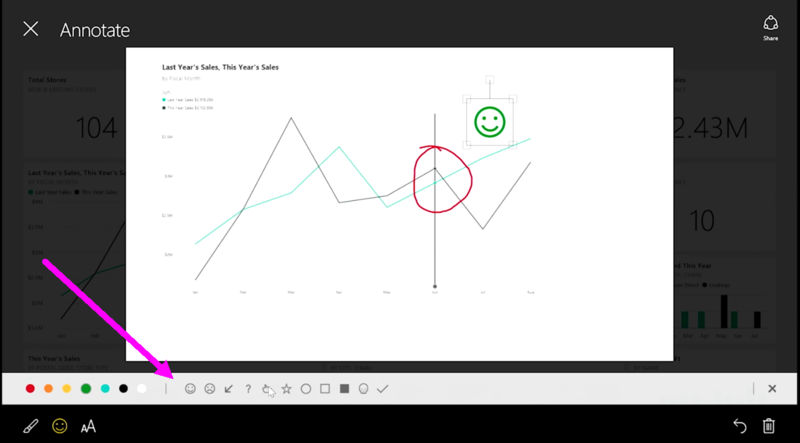 Power BI Desktop의 다른 게시 이벤트와 마찬가지로 게시 이벤트가 성공했음을 알리는 대화 상자가 표시되며 Power BI 서비스의 보고서 링크가 제공됩니다.And just like any other Publish event from Power BI Desktop, you see a dialog that tells you the publish event was successful, and you get a link to the report in the Power BI service. 이는 데이터를 수동으로 새로 고치는 한 가지 방법입니다.This is a way to manually refresh your data. 데이터 세트 및 보고서를 자동으로 업데이트할 수도 있습니다. 이 프로세스는 다른 학습 항목에서 다룹니다.You can also automatically update datasets and reports; that process is covered in another learning topic. 이동 중에 데이터를 추적하려는 경우 Power BI의 iOS, Android 및 Windows 디바이스용 모바일 응용 프로그램 중 하나를 사용할 수 있습니다.If you want to keep track of your data while you're on the move, you can use one of Power BI's mobile applications for iOS, Android, and Windows devices. 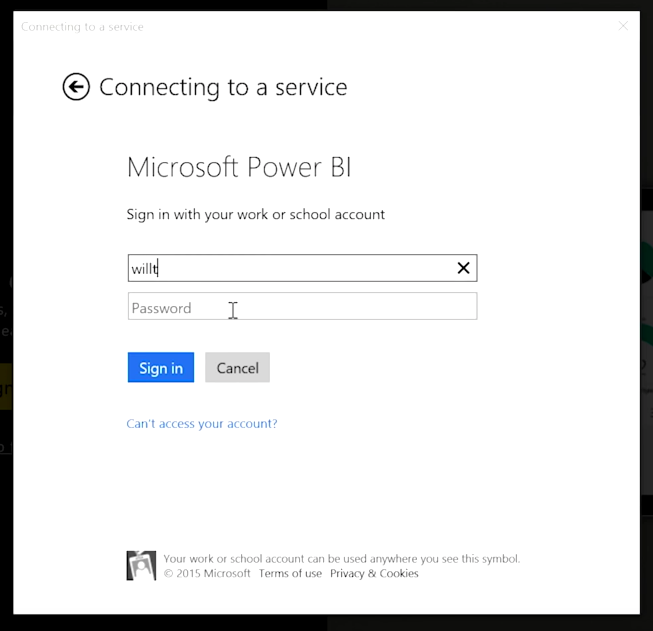 Power BI 앱을 사용할 경우 먼저 Power BI 서비스 계정 정보를 사용하여 계정에 로그인합니다.When using the Power BI app, first sign in to your account using your Power BI service account information. Windows 모바일 디바이스(이 예제의 경우 태블릿)의 로그인은 다음과 같습니다.On a Windows mobile device (in this case a tablet), the sign in looks like the following. 첫 화면에는 보고서, 대시보드 및 그룹을 포함하여 액세스할 수 있는 모든 콘텐츠가 표시됩니다.The first screen that you'll see displays all of the content to which you have access, including reports, dashboards, and groups. 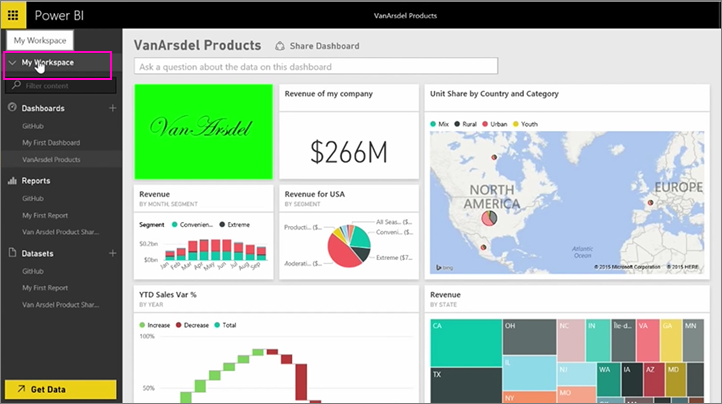 영감을 얻거나 Power BI 기능을 확인하는 데 사용할 수 있는 샘플 대시보드도 있습니다.There are also sample dashboards you can use to get inspired, or just to see Power BI's capabilities. 앱은 터치 기반이므로 대시보드 또는 보고서를 탭하여 전체 화면을 표시한 다음 손가락으로 스크롤할 수 있습니다.The app is designed to be touch-friendly: tap on a dashboard or report to view it full-screen and scroll through them using your finger. 대시보드 중 하나를 탭하여 열 수 있습니다.You can open any of the dashboards by tapping on them. 대시보드 내에서 대시보드 타일을 탭하면 더 큰 뷰에서 해당 타일에 포커스가 지정됩니다.Within a dashboard, you can tap on a dashboard tile to focus on it in a larger view. 오른쪽 위에 있는 주석 단추를 탭하여 발견한 정보에 주석을 달 수도 있습니다.You can also annotate any insights that you discover by tapping the Annotate button in the top right corner. 이를 통해 포커스가 있는 타일에서 특정 관심 영역을 강조 표시할 수 있습니다.This allows you to draw on a focused tile to highlight particular areas of interest. 주석 도구는 화면 아래쪽을 따라 있습니다.The annotation tools are found along the bottom of the screen. 오른쪽 위에 있는 공유 링크를 탭하여 주석이 지정된 타일을 공유합니다.Share your annotated tile by tapping the Share link in the top right-hand corner. 타일의 기본 보고서를 보려면 오른쪽 위에 있는 보고서 링크를 탭합니다.Tap the Report link in the top right-hand corner to view the underlying report for a tile. 그러면 웹 브라우저 또는 Power BI Desktop에서 보는 것과 동일한 시각화가 표시되며, 막대를 탭하거나, 드릴다운하거나, 슬라이서를 사용하여 보고서와 상호 작용할 수 있는 기능이 포함됩니다.This will display the exact same visualizations that you would see in a web browser or in Power BI Desktop, and also include the ability to interact with the report by tapping on bars, drilling down, or using slicers. 이 단원에서는 먼저 그룹을 만듭니다.In this lesson, we start by creating a group. 그룹은 특정 대시보드, 보고서 및 데이터에 대한 액세스 권한이 있는 사용자 집합을 정의합니다.A group defines a set of users who have access to specific dashboards, reports, and data. Power BI의 그룹은 Office 365의 그룹을 기반으로 하므로 Office 365 그룹을 사용하여 그룹의 전자 메일, 일정 및 문서를 관리하는 경우 Power BI는 동일한 기능을 제공합니다.Groups in Power BI are based on groups in Office 365, so if you've been using Office 365 groups to manage your group's email, calendar, and documents, you'll see that Power BI offers the same features, and more. 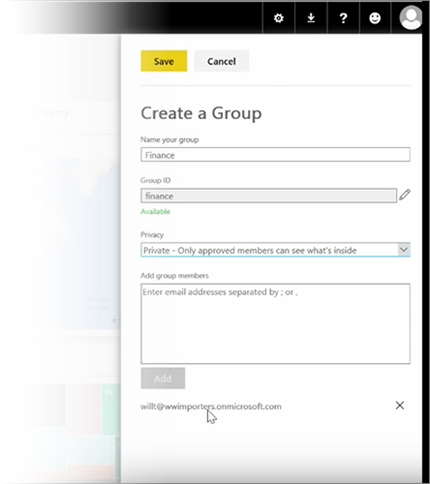 Power BI에서 그룹을 만드는 경우 실제로는 Office 365 그룹을 만드는 것입니다.When you create a group in Power BI, you're actually creating an Office 365 group. 이 모듈에서는 새 재무 그룹을 설정하는 시나리오를 사용합니다.This module uses the scenario of setting up a new finance group. 그룹을 설정하고, 대시보드 보고서 및 데이터 세트를 그룹에 공유하고, 그룹에서 항목에 액세스할 수 있는 구성원을 추가하는 방법을 알아보겠습니다.We'll show how to set up the group, share dashboards, reports, and datasets into the group, and add members who'll have access to the items in the group. 여기서는 내 작업 영역에서 시작합니다.I start here in My Workspace. 이것은 제가 만들었거나 다른 사람이 저와 공유한 대시보드, 보고서 및 데이터 세트입니다.These are the dashboards, reports, and datasets that I've created or that someone shared with me. 내 작업 영역을 확장한 경우 그룹 만들기를 선택할 수 있습니다.If I expand My Workspace, I can select Create a group. 여기서 이름을 지정할 수 있습니다.Here I can give it a name. 재무 그룹 시나리오를 사용하므로 재무라고 지정하겠습니다.We're using the scenario or a finance group, so I'll call it Finance. 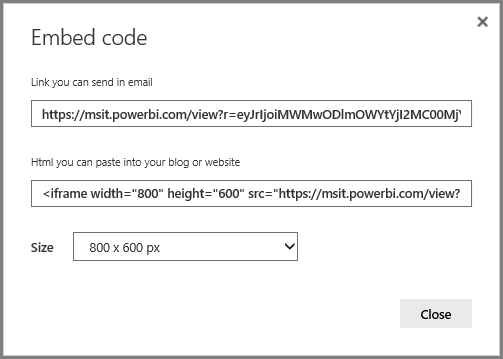 Power BI에서 이름이 도메인에 없는지 확인합니다.Power BI makes sure the name doesn't exist on the domain. 조직의 모든 구성원이 그룹의 콘텐츠를 볼 수 있는지 또는 해당 그룹의 구성원만 볼 수 있는지를 결정하여 개인 정보 수준을 설정할 수 있습니다.I can set the privacy level by deciding whether anyone in my organization can see the contents of the group, or only its members. 여기에 전자 메일 주소, 보안 그룹 및 메일 그룹을 입력합니다.I type email addresses, security groups, and distribution lists here. 추가를 선택하여 이들을 그룹의 구성원으로 지정하고 그룹을 저장합니다.I select Add to make them members of the group, and save the group. 다음 단원으로 넘어가겠습니다!On to the next lesson! 이 단원에서는 Power BI에 이미 있는 기존 아티팩트로 콘텐츠 팩을 만들고 동료와 공유합니다.In this lesson, we create a content pack with existing artifacts we already have in Power BI, and then share those with colleagues. 내 작업 영역에 대시보드, 보고서 및 데이터 집합이 있습니다.In My Workspace I have a dashboard, the report underneath, and the dataset. 조직의 구성원이 이를 사용할 수 있도록 패키지로 공유하려고 합니다.I want to share them as a package with people in my organization, so they can reuse them. 설정 아이콘(서비스의 오른쪽 위에 있는 기어)을 선택하면 사용한 저장소 양을 보고 콘텐츠 팩을 만들 수 있습니다.When I select the Settings icon (the gear in the top-right of the service), I can see how much storage I've used, and I can create a content pack. 대화 상자가 나타나면 이를 특정 개인에게 배포할지 또는 그룹에 배포할지 선택하고 제목을 지정할 수 있습니다.In the dialog that appears, I can choose whether to distribute it to specific people or groups, and also give it a title. 또한 콘텐츠 팩을 찾아보는 사람이 포함되거나 제공되는 내용을 알 수 있도록 설명 상자에 자세한 설명을 제공하는 것이 좋습니다.It's also a good idea to provide a detailed description in the Description box, to people browsing for a content pack to know what it contains or what it provides. 대화 상자 아래쪽에서 콘텐츠 팩의 이미지를 업로드한 다음, 가장 중요한 단계를 수행할 수 있습니다. 콘텐츠 팩에 포함할 대시보드를 선택하면 Power BI에서 대시보드에 사용된 보고서 및 데이터 세트를 자동으로 선택합니다.On the bottom of the dialog, I have an opportunity to upload an image for the content pack, and then the most important step: I select the dashboard I want to include in the content pack, and when I do so, Power BI automatically selects the report and dataset that are used in the dashboard. 콘텐츠 팩에 포함하려는 대시보드에 필요하므로 보고서 또는 데이터 세트의 선택을 취소할 수 없습니다.I cannot unselect the report or dataset, because the dashboard I want to include in the content pack requires them. 다른 대시보드, 보고서 및 데이터 세트를 선택할 수 있지만 지금을 그러지 않을 것입니다.I could also select other dashboards, reports, and datasets, but I won't now. 게시하면 조직의 콘텐츠 갤러리에 콘텐츠 팩이 추가됩니다.When I publish, the content pack is added to the organization's content gallery. 이전 단원에서 이미 콘텐츠 팩 및 그룹을 만들었습니다.In previous lessons, we already created a content pack and a group. 이 단원에서는 그룹의 모든 사용자를 위한 콘텐츠 팩 인스턴스를 만듭니다.In this lesson, we're going to create an instance of the content pack for everyone in the group. 이전 단원에서 만든 재무 그룹으로 다시 전환합니다.... and switch back to the Finance group I created in the earlier lesson. 그룹에 아직 대시보드, 보고서 또는 데이터 세트가 없습니다.The group doesn't have any dashboards, reports, or datasets yet. 제가 만든 콘텐츠 팩을 사용하도록 하겠습니다.I'm going to use the content pack I created. 타사 서비스 대신 제 조직에서 콘텐츠 팩을 찾아봅니다.I browse content packs from my organization rather than those from third-party services. 1분 전에 만든 콘텐츠 팩을 찾았습니다.I find the content pack I created a minute ago. 사용자가 쉽게 찾을 수 있도록 적절한 제목, 설명 및 이미지를 지정하는 것이 중요합니다.I see why it's important to give it a good title, description, and image, so people can find it. 콘텐츠 팩에 연결합니다.I connect to it. Power BI에서 콘텐츠 팩에 있는 대시보드, 보고서 및 데이터 세트를 가져옵니다.Power BI imports the dashboards, reports, and datasets that are in the content pack. 데이터 세트를 선택하면 Power BI에서 콘텐츠 팩을 개인 설정할지 묻습니다.When I select the dataset, Power BI asks if I want to personalize the content pack. 변경할 수 있는 콘텐츠 팩의 복사본을 만들고 게시된 버전의 콘텐츠 팩에서 연결을 해제합니다.I'm creating a copy of the content pack that I can make changes to, and disconnecting it from the published version of the content pack. 콘텐츠 팩 작성자가 게시된 버전을 변경한 경우 이러한 업데이트는 자동으로 제공되지 않습니다.If the content pack creator makes changes to the published version, I won't automatically get those updates. 하지만 원하는 경우 대시보드, 보고서 및 데이터 세트를 편집할 수 있습니다.But I can edit the dashboard, the report, and even the dataset, if I want. 따라서 콘텐츠 팩을 사용하면 조직의 다른 사람이 만든 콘텐츠를 간편하게 다시 사용할 수 있습니다.So content packs are a simple way to reuse content created by other people in your organization. 이 단원에서는 이전에 만든 원래 콘텐츠 팩을 편집하고 연결된 다른 사용자가 어떻게 업데이트되는지 알아봅니다.In this lesson, we're going to edit the original content pack we created previously, and see how that updates the other people who've connected to it. 원래 대시보드를 편집할 수 있는 내 작업 영역으로 돌아가겠습니다.I'm back in My Workspace, editing my original dashboard. 대시보드를 변경할 때마다 콘텐츠 팩에서 다른 사용자와 공유하는 항목을 변경했으므로 공유 버전을 업데이트하라는 알림이 표시됩니다.Anytime I make any change to the dashboard, I get this reminder that I've changed something that I've shared with others in a content pack, and prompting me to update the shared version. 설정 아이콘으로 다시 이동하여 콘텐츠 팩 보기를 클릭하면 이미 게시한 콘텐츠 팩이 표시됩니다.I go back to the settings icon and select View content pack to see the content packs I've already published. 제가 작성한 콘텐츠 팩을 확인합니다.I see the content pack I made. 이 작은 아이콘은 콘텐츠 팩의 항목을 변경했으므로 다른 사용자가 변경 내용을 볼 수 있도록 콘텐츠 팩을 편집해야 함을 나타냅니다.This little icon tells me I've changed something in the content pack, and I need to edit the content pack so others can see my changes. 편집을 선택하면 제목 및 설명을 편집할 수 있는 화면으로 돌아가지만 이번에는 업데이트 단추가 있으므로 이를 선택합니다.When I select Edit, I'm back at the screen where I can edit the title and description, but this time it has an Update button, so I select that. Power BI에서 이러한 변경 내용을 가져와 콘텐츠 팩 갤러리에 업데이트된 콘텐츠 팩을 게시합니다.Power BI takes those changes and publishes the updated content pack to the content pack gallery. 제 콘텐츠 팩에 연결된 모든 사용자에게 콘텐츠 팩이 변경되었음을 알리고, 변경 내용을 적용할지 또는 이전 버전을 유지할지 묻는 메시지가 표시됩니다.Anybody who has connected to my content pack gets a message that the content pack has changed, and asks if they want to accept the changes or keep the older version. 콘텐츠 팩 소유자는 동료가 사용 중인 버전을 관리할 수 있습니다.So as the content pack owner, you can manage the versions that your colleagues are using. 이전 문서에서는 조직에서 Power BI에 있는 콘텐츠를 쉽게 관리하고 공동 작업을 수행할 수 있도록 그룹을 만드는 방법을 살펴보았습니다.In an earlier article we reviewed creating groups to help your organization manage and collaborate on content that's in Power BI. 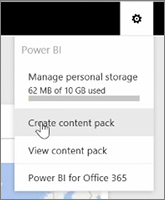 Power BI/Office 365 그룹을 사용하여 비즈니스용 OneDrive를 통해 공동 작업 및 공유할 수도 있습니다.You can also use your Power BI / Office365 groups to collaborate and share by using OneDrive for Business. 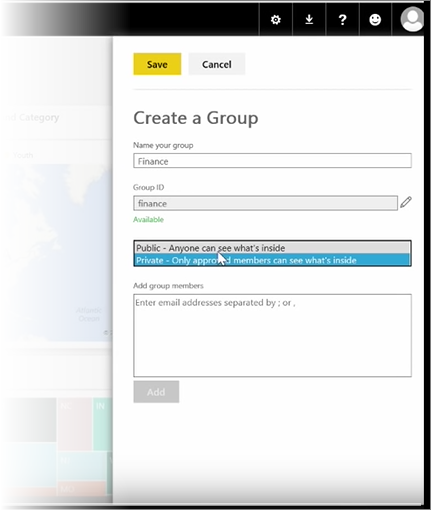 비즈니스용 OneDrive를 Power BI 콘텐츠 소스로 사용하면 버전 기록과 같은 여러 가지 유용한 도구에 액세스할 수 있습니다.Using OneDrive for Business as a source for your Power BI content gives you access to a number of helpful tools, such as version history. 또한 비즈니스용 OneDrive 내에서 Office 365 그룹과 파일을 공유하여 액세스를 제공하고 여러 사람이 동일한 Power BI 또는 Excel 파일에서 작업하도록 허용할 수 있습니다.You can also share your files with an Office365 group from within OneDrive for Business to give access and allow many people to work on the same Power BI or Excel files. 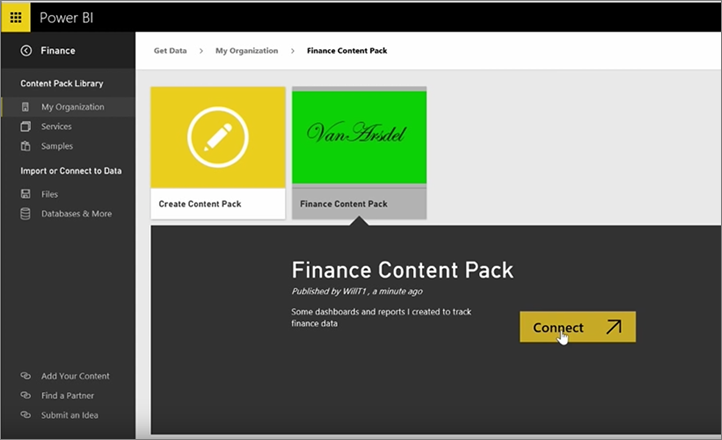 비즈니스용 OneDrive에서 PBIX(Power BI Desktop) 파일에 연결하려면 Power BI 서비스에 로그인하여 데이터 가져오기를 선택합니다.To connect to a PBIX (Power BI Desktop) file on OneDrive for Business, sign in to the Power BI service and select Get Data. 데이터 가져오기 또는 연결 아래에서 파일을 선택한 다음 OneDrive - 비즈니스를 선택합니다.Choose Files under Import or Connect to Data, and then select OneDrive - Business. 원하는 파일을 강조 표시하고 연결을 선택합니다.Highlight the desired file, and select Connect. 탐색 모음의 왼쪽에 콘텐츠가 표시됩니다.Your content appears in the left-hand side navigation bar. 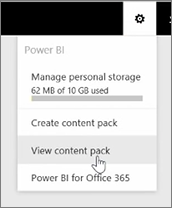 이제 비즈니스용 OneDrive에서 파일에 적용된 변경 내용이 Power BI 환경에도 자동으로 반영되며 버전 기록에 기록됩니다.Now, any changes made to the file on OneDrive for Business will be automatically reflected in the Power BI environment as well, and recorded in the version history. 이 단원에서는 간단히 몇 단계를 거쳐 웹 페이지에 Power BI 보고서를 공유하거나 전자 메일을 통해 공유하는 방법을 설명합니다.In this lesson, we learn how to share a Power BI report on a web page, or share it through email, in just a few simple steps. 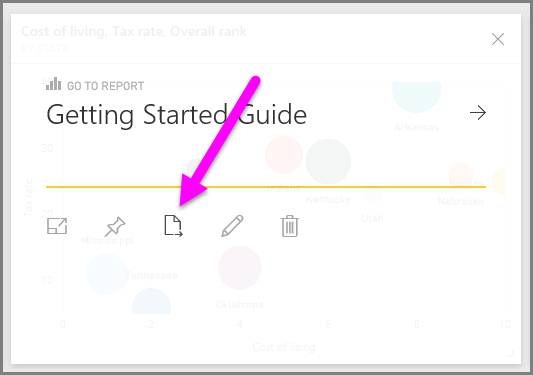 Power BI의 이 기능은 웹에 게시라고 하며 쉽게 사용하고 관리할 수 있습니다.This feature of Power BI is often referred to as Publish to web, and it's easy to use and to manage. 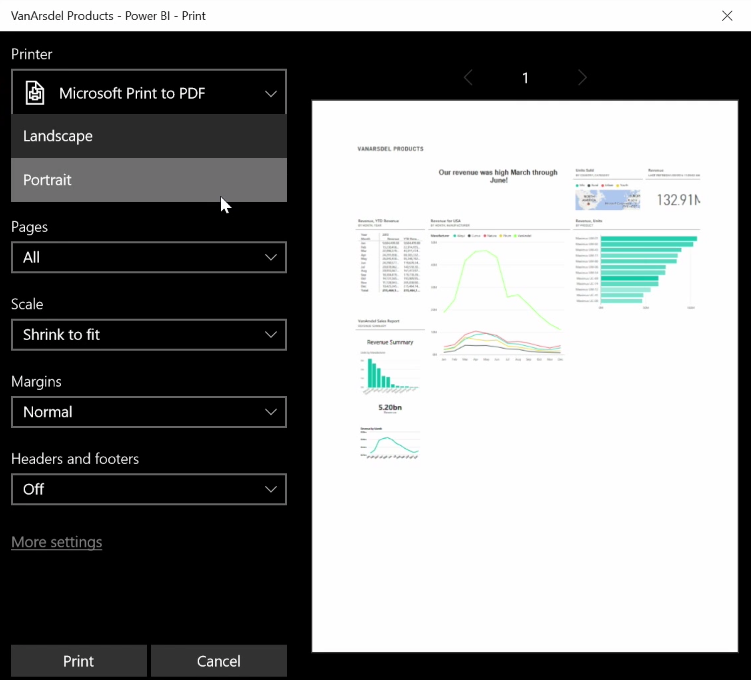 Power BI에서 공유하려는 보고서를 선택하여 캔버스에 보고서가 표시됩니다.In Power BI, select the report you want to share, so it's displayed on the canvas. 그런 다음 메뉴에서 파일 > 웹에 게시를 선택합니다.Then from the menu, select File > Publish to web. 여기에서 웹 사이트 또는 메일에서 보고서를 포함할 수 있도록 하는 embed 태그 를 가져오는 방법에 대해 설명하는 대화 상자가 표시됩니다.From there, you see a dialog that explains you'll get an embed code that lets you include the report on a website or in mail. embed 태그 만들기 를 선택하면 Power BI에서는 모든 사용자와 인터넷에 있는 데이터를 공유하게 된다는 점을 알려주는 다른 대화 상자를 표시합니다.When you select Create embed code, Power BI presents another dialog, telling you again that you're about to share your data with everyone on the Internet. 맞는지 확인하세요.Make sure that's okay! HTML 링크의 경우 포함된 보고서에 대해 미리 정의된 크기 중에서 선택하거나 직접 iframe 코드를 수정하고 크기를 사용자 지정할 수 있습니다.For the HTML link, you can choose from predefined sizes for the embedded report, or you can modify the iframe code yourself and customize its size. iframe 링크를 블로그 게시물이나 웹 사이트 또는 Sway에도 포함할 수 있습니다.You can also embed that iframe link into a blog post or website, or into Sway, too. 만든 embed 태그를 삭제하시겠습니까?Want to delete an embed code you created? 그러나 문제가 되지 않습니다.No problem. Power BI에서 오른쪽 위에 있는 기어 아이콘을 선택한 다음 embed 태그 관리 를 선택합니다.In Power BI, select the gear icon in the upper right corner, then select Manage embed codes. 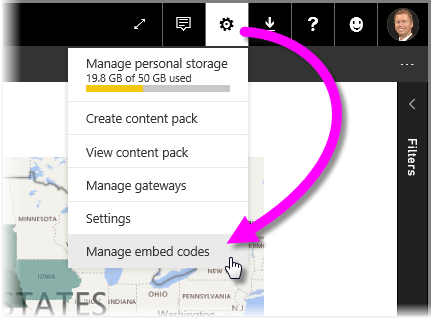 Power BI 작업 영역에는 만든 embed 태그를 표시합니다(아래 이미지에서는 한 개임).The Power BI workspace shows the embed codes you've created (in the image below, there's just one). 줄임표를 클릭하면 embed 태그의 코드를 가져오거나 embed 태그를 완전히 삭제하도록 선택할 수 있습니다.When you click the ellipses, you can then select to get the code for the embed code, or delete the embed code entirely. 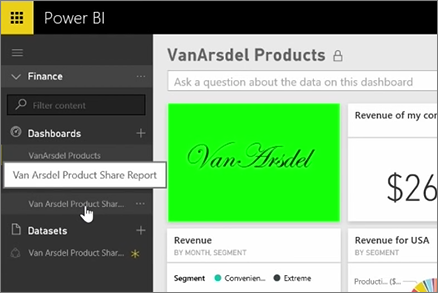 Power BI 보고서를 웹에 게시하여 전 세계와 공유하는 방법은 여기까지입니다.And that's all there is to publishing your Power BI report to the web, and sharing it with the world. 간단합니다.It's easy! 이제 완료되었습니다.You did it! 축하합니다!Congratulations! 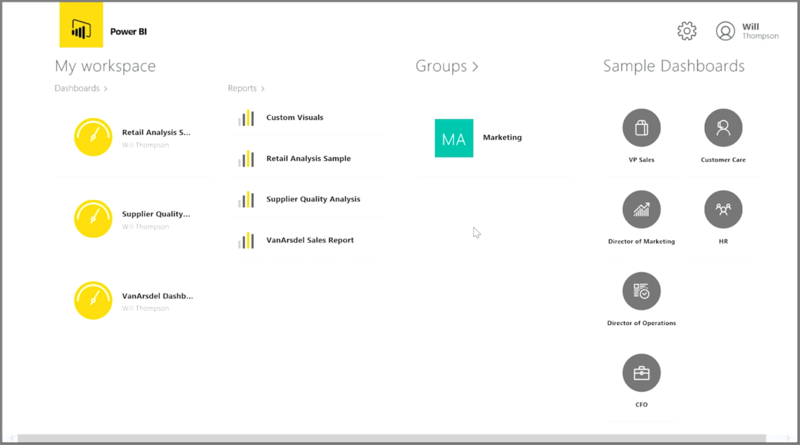 Power BI에 대한 단계별 학습 과정을 완료하셨습니다.You've completed the Guided Learning course for Power BI. Power BI의 기본 요소를 배우고, 해당 소프트웨어 기능 및 요소를 살펴보았으며, 모든 기능 및 요소가 함께 작동하는 방식을 알아보았습니다.You've come full circle from learning the basic elements of Power BI, taken a tour through its software features and elements, and learned how they all work together. 유용한 도움말 및 참조 콘텐츠도 많이 있습니다.There's more help and reference content available, too. 이 페이지의 맨 위로 이동하여 학습 > 설명서를 선택하면 다양한 Power BI 참조 콘텐츠 집합을 볼 수 있습니다.Just go to the top of this page, and select Learning > Documentation to see our extensive set of Power BI reference content. 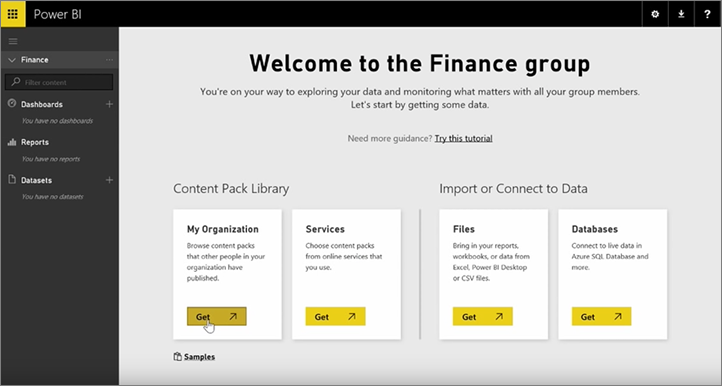 이 Power BI 단계별 학습 과정이 유익한 시간이 되셨기 바랍니다.We hope you've enjoyed your journey through this Power BI Guided Learning experience. Power BI 시각적 개체는 언제나 멋지고 몰입도가 뛰어날 수 있습니다.Best of luck to you, and may your Power BI visuals always be immersive and compelling. 더 보시겠습니까?Still want more? DAX(데이터 분석 식) 를 사용하여 Power BI에서 사용자 지정 열과 테이블을 만들거나 필터링하거나 사용하는 데 관심이 있으십니까?Interested in using DAX (Data Analysis Expressions) to create, filter, or use custom columns and tables in Power BI? Power BI에서 코드 작업을 하려는 사람들을 대상으로 하는 추가 섹션은 DAX 소개입니다.There's one more section targeted at people inclined to do some code work in Power BI, and it's called Introduction to DAX. 관심이 있으시면 살펴보겠습니다. 단계별 학습의 나머지와 같은 친숙한 방법을 사용합니다.Take a look if you're interested - it uses the same friendly approach as the rest of Guided Learning. 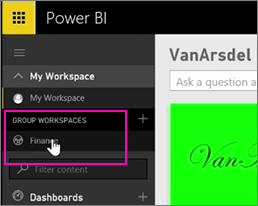 Power BI에 대한 단계별 학습 과정의 게시 및 공유 단원을 마쳤습니다.You've completed the Publishing and sharing section of Power BI Guided Learning. Power BI 쿼리 작성에 사용되는 언어인 DAX를 도입하려면 다음 자습서를 진행하세요.If you want an introduction to DAX, the language used to create Power BI queries, head to the next tutorial.